Three Sisters - the Triple Morrigan . 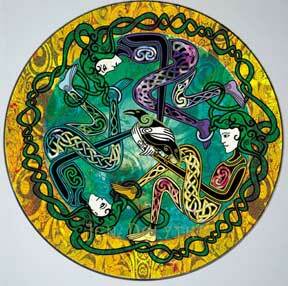 Throughout mythology, Celtic goddesses frequently appear in triple form. The Triple Morrigan ("Great Queen"), also known as Badb ("Crow") is the ancient Celtic death Goddess of victory, prophecy, and battle — the raven is her totemic bird. Within Arthurian myth she appears as Morgan Le Faye, King Arthur's witch half-sister - as a powerful and dark influence. The Morrigan ruled with her ‘nine-sisters’ who are said to guard and tend the cauldron of rebirth in the depths of Annwn, cooling it with their breath. Within Greek mythology, the divine sisters appear as the Muses, known as the three Graces, or Fates. In Norse legends they are the Norns, who live near the "Well of Urd" at the base of the tree Yggdrasil, which connects the nine worlds found in Norse mythology. In Native American mythology, squash, corn, and beans are known as of the "three sisters." Often depicted as being clothed in the leaves of the crops over which they are guardians, the sisters are also, in some legends, the daughters of the Earth Mother.